On Saturday I hopped a Greyhound and headed out to New Hamburg, ON (halfway between Kitchener and Stratford) to teach a class at Shall We Knit? Timing was a bit tight what with the bus getting into Kitchener (very sketchy bus stop, that Sportsworld) at 11:30 and the class starting at 12, but everything worked out. 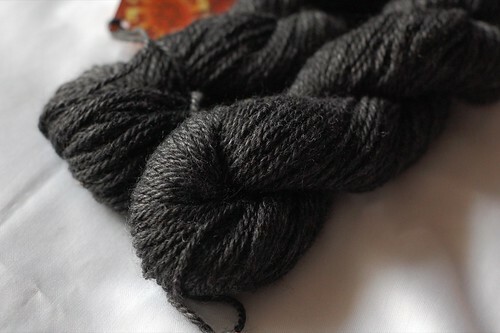 We did a top-down mini sock with a short row heel with Magic Loop. All the students were great, although the conference room we were in was a bit tight for 11 people! After the class I wandered about the shop, which is really lovely – bright, lots of beautiful yarn, lots of interesting stuff (“giftware”). I picked up quite a pile of yarn! There wasn’t quite enough of the brown, so I got a bit of blue for a contrast colour. 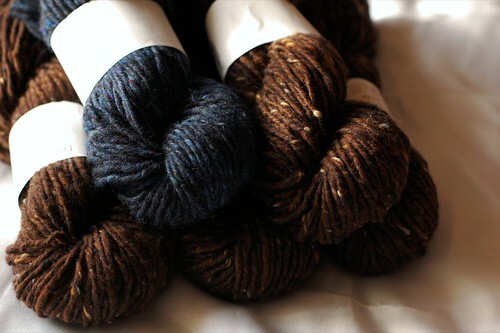 And some gorgeous little bits of loveliness – Koigu mill ends! I love the colours all together. I’m thinking either a colourwork cowl or maybe the yoke of a sweater. I do have quite a bit of other bits and pieces of Koigu so there’d be a bunch to choose from! 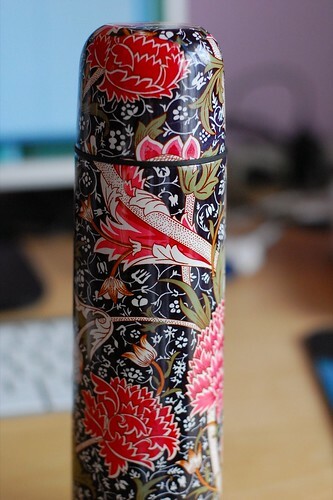 It’s a V&A printed vacuum flask. I’m not sure what I’ll put in it, probably just water (since that’s what I drink mostly!) although it might be a bit of hassle what with there being two lids, the cup and the vacuum seal. At any rate, it’s awesomely pretty. Then I got a ride back to Kitchener to get on the bus and come home. I may not have left the shop with much money after picking up all this yummy yarn, and I may have spent over three hours on various forms of transit that day, but it was really fun. And if Shall We Knit was closer I’d totally shop there! My inlaws used to love near New Hamburg but I never knew about the shop. Darnit! I could be wrong, but I’m guessing you spent more on purchases at the yarn shop than you earned for teaching – what sounds like – a fabulous knitting class. LOVE the yarns and the flask. That sounds like a great shop, but I’m partial to any place with the tweedy yarns. They give so much visual interest to an otherwise simple knit! 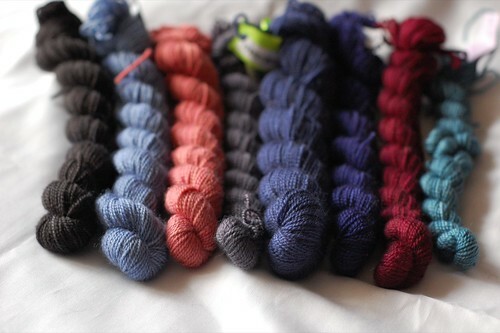 Great looking yarns! I really like the tweed you picked out. Love the flask too! Oh I was in Kitchener with nothing to do on Saturday, I should have come to the meet & greet part at least. Oh, and the downtown Kitchener bus terminal isn’t so sketchy, I didn’t even know it stopped at Sportsworld. That is a stunning flask! I love V&A prints, they’re so beautiful. They do amazing cards too. Ooh, that flask is super gorgeous! And I think 2009 should totally be the Year of the Yoked Sweater. If you r looking for Paid Surveys this is the site 4 u.